petition: Send the tortured 57 elephants of Guruvayur Temple to a sanctuary and close training camps! Send the tortured 57 elephants of Guruvayur Temple to a sanctuary and close training camps! At the Guruvayur Temple in Kerala in South India, 57 elephants are held in chains in unbearable conditions! They cannot move and stand still on the same spot and are beaten badly! 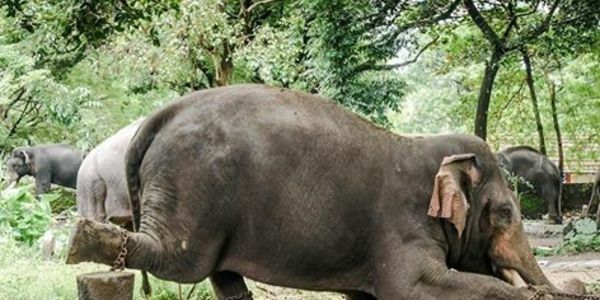 In Karnataka, the adjoining state to Kerala, deep into the forest, is a hidden training camp where there are 30 captured wild elephants, including babies! The only food given here is dry palm leaves. An elephant in the wild will eat a wide variety of grasses, fruit, leaves and vegetables. In the wild, an elephant will drink 140 to 200 litres of water a day. Here, they are lucky if they get five to ten. WildlifeSOS has agreed to take them all in! They must be freed!